Each year, bed bugs cause distress for thousands of people throughout the world. If you are one of them, it’s critical that you take the necessary steps to get rid of them as soon as possible. While this task is not easy and may even require the assistance of a pest control expert, The Bug Squad has a number of guides to help you where possible and I encourage you to check them out if you are fighting an infestation. However, in this article, we are going to discuss a rather frequent question that I get from my readers about the possibility of flying bed bugs. Can bed bugs fly? Let’s find out! Bed bugs rely on crawling or by “catching a ride” with humans (such as in your bags, etc.) if they want to move around, maybe to find their next meal. If you have encountered “bed bugs that fly”, chances are high that the insect has been misidentified and it’s actually some other type of bug. Personally, after finding out that bed bugs cannot fly, I was fairly relieved. Bed bugs can cause enough problems without having the ability to fly around the house. If these bugs could fly, it would make extermination even more difficult than it already is! You may have read something online about bed bugs having wings, thus it is a reasonable assumption that they should be able to use them for flight. Do bed bugs fly using them? No, the truth is that once fully matured, an adult bedbug only has wing pads and these cannot be used for flight. They appear just above the abdomen, below the head and as you can see in the picture, they are very small. Just remember that nymphs (baby bed bugs) don’t even have those wing pads on their body so looking for wings is not a great way of identifying bedbugs. 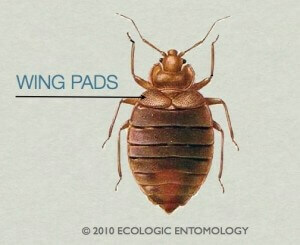 My thanks go to Ecologic Entomology for the fantastic image that show these pads. A bed bug has six legs and fairly long antennae. If you find a bloated, eight legged blood sucking insect, it’s highly likely that you have found a tick. If you find small bugs that jump away when you try and catch them, you may have found fleas. Mature bed bugs are about 1/4 inch in length and are completely flat, unless they have had a recent blood meal. Baby bed bugs are a lot smaller (about 1mm) and can be extremely difficult to find, especially if they are trying to hide. Bed bugs often conceal themselves in cracks and in other dark, sheltered areas so keep that in mind when you are searching for them in your home. Bedbug bites can be rather painful and although they do not spread disease, I highly recommend that you treat the affected area and seek medical assistance if it starts to swell up. The only place you can find bed bugs is on your mattress. False, they are often found all over your room so if you find an infestation in your bed, make sure that you investigate other areas as well! Bedbugs only feed during the night. False, they eat whenever they are hungry. If you took a daytime nap on a bed that has a number of bed bugs, they will come for you! Using a bedbug spray is enough to kill them off. False, unless the infestation is extremely small, most sprays won’t be enough and can actually cause further problems if used incorrectly. The Bug Squad has a decent bed bug spray guide that you can read to find out more information on this subject. I love the article on bed bugs that seem to be able to fly! Hopefully it opens a lot more of people’s minds on how easy bed bugs can be transported in to homes and businesses around the world. Hey! Its a pleasure, thanks for your kind words. I have left your business link in your comment to show my appreciation for your comment. Its always nice when a reputable pest control company takes the time to read and contribute to a community based blog. Have a good one! BedBugs are attracted to what you exhale. No matter where you decide to lay your head, they will find you. The BB’s feed only to molt and when they have completed the molting process to become an adult, then they feed to produce eggs or to provide energy to mate. BB’s have been known to go 6-9 months without feeding, however if there is a wiling host, they will feed more regularly. BB’s live in the cracks & crevices in your home…think walls, electrical outlets, baseboards etc. The sprays don’t work because you aren’t treating where they live, also most are a mishmash of oils that aren’t effective. Hey Brad! Yep, quite a scary thought, they are like silent ninjas that hunt you down lol. Thanks for your additional info, I really appreciate it and I am sure the community does as well. Hope you visit again soon! About 4 days ago I fell into the bit of bed bugs. My cleaning lady called me a told me she found bugs in our bed and curtains and wall. I had been getting bit but thought It was a rash. This has been going on for about month. I hired a professional to come out to do the job. It was just or much for me . I have wash cloths and sheets and has the bed and box springs sprayed by the pros. My big gist concern now are the clothes and things in my closet. I was told not to carry anything from our bed room through the house in case there were eggs on our cloths. So I think I am just going to dry all the clothes I. Our closet. My question in what can I do for them not to return. One profession guy that came out scared me to death said the could be all over my house. And that we. Any never get rid of them. I am so confused and hope all the money and cleaning that I have been doing will work. We could not get rid of our mattress cause it is only 3 months old. I got rid of the chair that was I. Our bed room. It need to go any way. Also put covers on both mattress and box springs. Also is it true that they just run and hide until the chemicals go away. Just want so information. Hey Lambert! They can run when chemicals are applied, hence why if a professional comes and does the job, they can help eleviate the problem somewhat because they will use residule poison. I recommend that you try DE first (read my article on this, its under fleas but its the same application process) as this is great for killing bed bugs, provided they come into contact with it and you do not have a massive infestation. Cheers! I have been freaking out for the last 4 days! I was making my bed and found a bug in the crease. I immediately squished it not thinking. I looked at it, it was light in color and had from what I could tell clear wings. I’m not 100 percent if they were wings or not. I know bed bugs cannot fly, but do they have clear wings? I have been constantly been checking my bed and box spring and not finding anything. Am I being super paranoid!? I also have food grade DE from when we had an issue with fleas so i put that down everywhere. I cant seem to get my mind off of this and need some reassurance. I think im driving my boyfriend crazy! Haha! Thank you for your time! Hi I have been getting bit constantly at night….how do I know if it is bed bugs, fleas or like a neighbor said dust or clover mites….is it one solution that kills all these things. Also I have a pile of winter hats and scarves in my room in a basket, should I throw them away, what should I do???? Hi Keray, spend some time trying to find the bug that is biting you, then we can brainstorm a treatment method. How can I tell what’s biting? I’ve search for bedbugs no sign of them. I’m getting welts like masquito bites on my back, neck and on top of eye! I pray it’s not bedbugs. I’ve caught some fleas on sticky tape. I’m so stressed over this can I share pictures? Hi Melissa, you can send them to me via the contact form. To be honest, if you have caught fleas already, it’s probably that. Hi, I’ve been getting bed bug bites on my body but I’m not too sure whether they’re from my home or elsewhere. I saw distinct clear wings flapping when I caught one but it couldn’t fly. Can I send you a pic via email so as to confirm what the bug is? Is it true that fabric softener sheets will keep thrm away or is this just a myth? Hi David, unless it has a repellent, it won’t keep them away. I have had bites all over my body … Dealing with this for while now. It started literally about 5years ago when I was constantly itching. I called ORKIN and the guy came out and said 100% they were not bed bugs. I wasn’t convinced but, he’s the pro so I let it go. Well I am covered in bites! Now that the summer is hear it’s really hot in my room like 85F and I’ve noticed them dropping from the ceiling at night on my shirt. Anyway, I have done some research and I think these are a “New species” because they are really hard too squish em and they “DO FLY”!!!! I know, I know…. bed bugs don’t fly but this looks like a brown Appleseed and it flutters and flies in small spurts? Like I few inches up then almost straight forward and it has brown wings and is about the size of a small ant. I’ve been unable to catch them until recently. I’ve spread these to my job so I know it’s not in my head as the ORKIN man said. Now everyone in my house itches…if this is not a bed bug it SURE ACTS LIKE IT!!! I think the government is saying that they don’t spread no diseases because it would be a public crisis with these bed bugs and because they have no effective treatment as many are immune too pyrethrums and others known pesticides. Also, like it or not if they drink blood they can spread diseases. I would like for an entomologist to take a look at this but I don’t know any. Any advice as I’ve been living in hell for 5 years because no one takes it seriously unless you can catch one… I’m literal spreading these everywhere I go and there is nothing I can do about it. Trust me this is NOT IN MY HEAD! Hi Simon, goodness! That sounds hectic, sorry that you are dealing with this. Based on your description, I believe you but I don’t know offhand what that little insect could be. I suggest you definitely get a entomologist to take a look, please let me know what they say and maybe I can help you fight it.